Preliminary ProceduresRaise and support the vehicle. Refer toLifting and Jacking the Vehicle.Drain the transmission, refill when repair is completed.Refer toTransmission Fluid Drain and Fill.Remove the radiator air lower baffle and deflector assembly.Refer toRadiator Air Lower Baffle and Deflector Replacement.Remove the front transmission mount and bracket. Refer toTransmission Front Mount Replacement.Remove the control valve body cover. 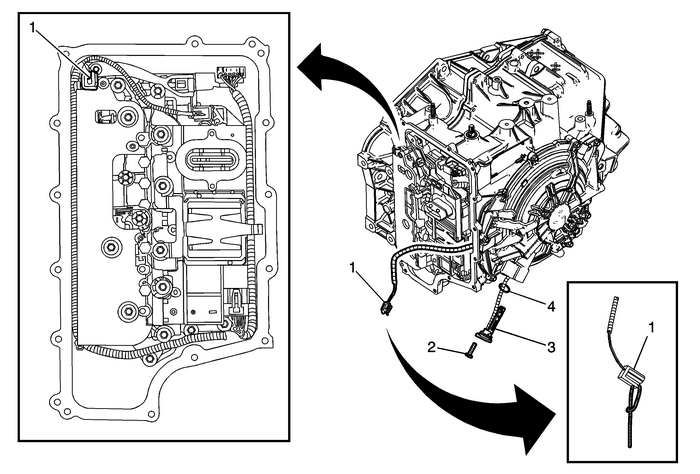 Refer toControl Valve Body Cover Replacement.Perform the service programming system procedure. Refer toService Programming System (SPS). Attach theDT-47734tetherto the ISS electrical connector locking tab before removalof old ISS to assist in installation of the new ISS. Apply threadlocker GM-P/N-12345382(Canadian-P/N-10953489) or equivalent to theinput speed sensor bolt. Tip:After an internal transmission repair or internal partreplacement the service programming system procedure should beperformed.